Jiu-jitsu.News: Registration for the “Ukraine Jiu Jitsu Selected” championship is opened! 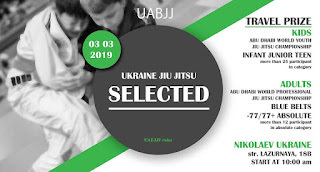 Registration for the “Ukraine Jiu Jitsu Selected” championship is opened! Registration for the open BJJ championship “Ukraine Jiu Jitsu Selected” has recently started! The competition will be held on the territory of the Sports and health complex “Namyv” in Nikolaev city, on March 3rd. Sportsmen of different age categories are invited to participate in the championship: kids (4-11 years old), teens (12-15 years old), juveniles (16-17 years old), adults (18-29 years old) and masters (30-40 years old). According to the championship rules, all fights will take place on four carpets. Young athletes in the age category from 4 to 9 years old will compete until the 2nd loss, and participants of other categories - up to the 1st defeat. Winners will be awarded with medals, certificates, and team cups. In addition, tickets on the “Abu Dhabi World Jiu Jitsu championship” will be raffled at the competition. This major event will be held in Abu Dhabi, UAE on April 20-26. 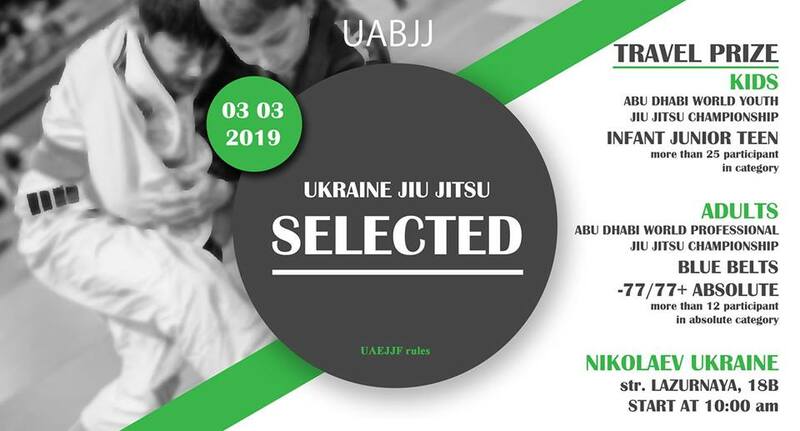 The “Ukraine Jiu Jitsu Selected” championship was organized by the Nikolaev Jiu-Jitsu Association. Closing date for applications is set on February 27.